I just turned 15, and in accordance with family tradition, we did something fun and memorable. I had been wanting to go four-wheeling for a while, and this seemed like a good opportunity. 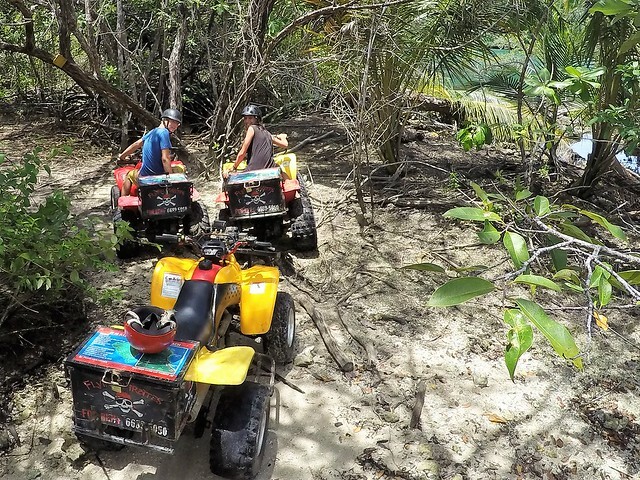 There are miles of jungle and beach trails on Isla Colon, and you can rent an ATV for a half- or full-day. So we made a reservation for 10:00 AM for Eli, Dad, and me on the 21st of September (my birthday). When we got there, we had to sign some paperwork, then they showed us where to go on a map, showed us how to use the quads (gear shifting, brakes, etc. ), and sent us on our way. The first part was a stretch of road, and we used the easy terrain to get used to the vehicles. At the end of the road, we reached the Flying Pirates property, and turned onto a trail that led off into the jungle. The trees and bushes turned to scrub, and the trail to sand. This is when it started to become difficult. The trail was somewhat compacted, but it was littered with chunks of rock and other debris, then it sloped down to water on the right. We each got stuck at least once on this stretch, and needed each other’s help to get unstuck. Then came the mud pit: it was about 1 foot deep, 30 feet long, and very uneven. It was actually just a short stretch of really bumpy ground submerged in water. The guy who gave us the quads had warned us about this; he said you had to keep up momentum to prevent from flooding the engine. They had even put up a sign that said, “You can do it,” and we did. Eli went first, and gunned the throttle, bouncing and getting thrown around the whole way. I wasn’t any better; I also used too much throttle, lost control, and ran up on the bank, nearly rolling over. Dad went through without a problem. On the other side, we had to stop and get off, because the engines got wet and were steaming like crazy. Next up was the Blue Lagoon. The Blue Lagoon is one of the places you can reach on the trails, and is like a giant limestone tide-pool in which you can swim. We were hot, so we jumped in and went for a blessedly cool swim. The next segment of the trail was fairly difficult, and we each got stuck a couple of times. Most notably, there was a mud pit with a deceptively dry crust into which Eli plunged headlong. It created a typical scene with someone bogged down in the mud, spinning their wheels like crazy. Luckily, each of our vehicles was equipped with a rope on a bracket on the front, and Dad hooked Eli’s around his differential, and hauled him out of there. We also got lost once, and went ahead on foot to scope out the trail. When we got back, my quad wouldn’t start. We thought it was a dead battery, and were pretty worried, until we figured out that the starter was jammed. After banging on it a couple of times, we got it going again. We then encountered a hill that might be considered hard for some people to hike up, let alone drive up on ATVs! Dad, of course, went up with no problem (he always makes it on the first try! ), then Eli tried. He went right up, lost control, and began rolling down the side, off the trail. He quickly got off the ATV, and it rolled a little farther before hitting a tree. We then worked together to lift it up and roll it back to the bottom of the hill to try again. There were other times like these, when we just had to gas it, hold on tight, and try to stay on the trail. On the way back, now that we were familiar with the vehicles we could go much faster—and are those things fast! Fast enough that when my helmet began to blow off of my head, I decided to slow down. When we got back, we had cold sodas (or in Dad’s case, cold beers), watched the parrot-mascot, “Maestro,” climb up the wall, and checked out the shop. Flying Pirates has a good number of ATVs, some of which are being repaired, and they run a pretty big operation, modifying, and even building their own vehicles. The people were also super-friendly and relaxed, which made us feel even more comfortable. To sum up, it was a loud, fast, dangerous activity, and pretty much the best birthday I’ve ever had.